As the United States navigates a trade war, some local companies and officials are keeping a close eye on the effects of the country’s trade situation and tariffs imposed on domestic and foreign goods. Pete Peterson, founder and CEO of Manufacturing Methods, said that while business has been stronger than ever for the Leland-based operation, the company is preparing for what he described as an uncertain situation. “We have to deal with this, but it hasn’t caused a slowdown in our business. It’s just increased the cost of doing business,” Peterson said about aluminum and stainless-steel prices due to higher tariffs on its supplies. Manufacturing Methods makes products for a range of industries, most recently in the medical device business, through a variety of services and precision manufacturing. The company employees about 50 people. Those tariffs on aluminum and steel from the European Union, Canada and Mexico took effect earlier this summer. Other hikes hit the housing industry last year when the U.S. added a 20 percent or more duty on lumber from Canada. That country and Mexico began additional tariffs on American goods this month in response to the U.S. actions. On July 6, the U.S. added tariffs on more than 800 products representing $34 billion worth of imports from China. Those tariffs impose a 25 percent levy on the goods, which range from manufacturing equipment and nuclear reactors to boat motors and lithium batteries. The Trump Administration has signaled that more could be on the way. China responded to the move with new tariffs of its own on imported U.S. goods. Tariffs and trade relations are not a new debate for the country, said Robert Mark Spaulding, a history professor at the University of North Carolina Wilmington who works mostly on the history of trade. The nation, however, has seen steady foreign trade relations since World War II, he said. And the results of another round of tariffs on billions of Chinese goods could have a big impact on the economy, he said. But Spaulding said it’s still too early to tell what the impacts might be. The tariffs aim to target unfair trade by the Chinese, problems in the trade relationship that have been recognized by Democrats and Republicans alike, he said. Those issues lie in intellectual property transfer, Chinese government subsidies to producers and the country’s currency manipulation, Spaulding said. “Whether we can get there by putting tariffs on Chinese exports … I don’t know. That’s what we are going to try. No one really knows how the Chinese are really going to respond to that,” Spaulding said. Gov. Roy Cooper said at a tour of the Port of Wilmington in June that he feared a trade war could have negative effects on North Carolina’s economy, adding that the nation needs fair trade across the globe. “I am deeply worried that our farmers and jobs here at the port could potentially be in danger if we see an escalation of a trade war across the world,” Cooper said. Tariffs imposed this year by Mexico and now China on U.S. imports of pork already has the state and nation’s hog farmers concerned. Pork is also one of the current food exports through the Port of Wilmington. N.C. Ports officials said earlier this month that they are “monitoring any potential tariffs on goods moving through U.S. Ports,” but did not comment further on the tariffs situation. Imports and exports through the countries involved such as China, Mexico and Canada, have had a big impact on the state. 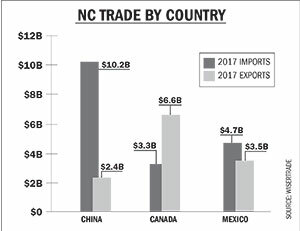 According to 2017 numbers released by the Economic Development Partnership of North Carolina from WiserTrade, China was the state’s largest source of imports in total volume, followed by Mexico and then No. 4-ranked Canada. On the export side, Canada ranked as the largest market by total value in 2017, with Mexico coming in second and China in third. One of the state’s largest exporting industries is the aircraft parts and engines sector, Spaulding said. GE Aviation, a manufacturer of jet engines, components and integrated systems for aircraft, has operations in Castle Hayne, alongside GE Hitachi. General Electric Co. officials said their position on the United States’ tariffs on Chinese imports is that, “GE has long supported free and fair trade, with open access to markets in the United States and around the world. “We remain concerned that these tariffs could make it harder for U.S. manufacturers to compete in the global economy, and will shrink rather than expand U.S. exports. We will work with the administration to minimize potential impact to our businesses,” a spokesperson for GE’s corporate offices said. The potential renegotiation or withdrawal from the North American Free Trade Agreement (NAFTA) is another concern for business, Spaulding said. “We are already at a point where we are at uncertainty, and uncertainty is not good for business,” Spaulding said of the tariffs and country’s foreign trade relations. The impacts of uncertainty are also being felt in the homebuilding industry, said Dave Spetrino, president and founder of PBC Design + Build. “Unpredictability is extremely expensive in commerce. The downside is far greater than the upside in situations like this. Fortunately, [the uncertainty] is temporary, but it never feels that way when you’re in the middle of the situation,” he said. From 2017, Spetrino said lumber pricing continued to edge up higher with each project. Wood product prices, which make up about 20 percent of the firm’s construction costs, had increased nearly 70 percent between January 2017 and June, he said. And prices on wood lumber aren’t retreating. Between May and June, Spetrino said, the company saw a 12 percent increase in framing lumber. Those increases were a result of the tariffs as well as large firms stockpiling lumber, driving demand and prices up, he said. 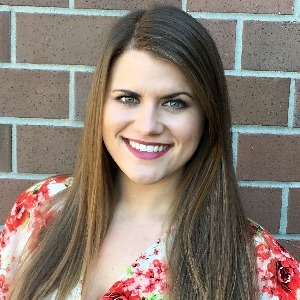 “There may be some initial pain on the part of the supplier, distributor or retailer, but ultimately the consumer pays for everything in the end,” Spetrino said. He said his homebuilding firm is finding ways to balance the price increases for customers. The tariffs on steel also have impacted the homebuilding business, he said. “To offset price increases to our client, we’ve worked harder than we ever have in the past to reduce costs and inefficiencies in other parts of the homebuilding process,” Spetrino said. 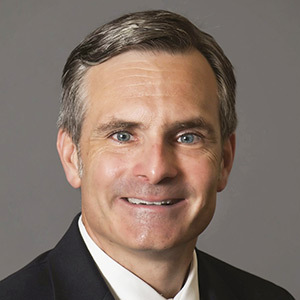 Manufacturing Methods is also trying to find ways to take the edge off for its customers by looking to make some of its processes even more efficient and by price shopping additional suppliers for materials, Peterson said. 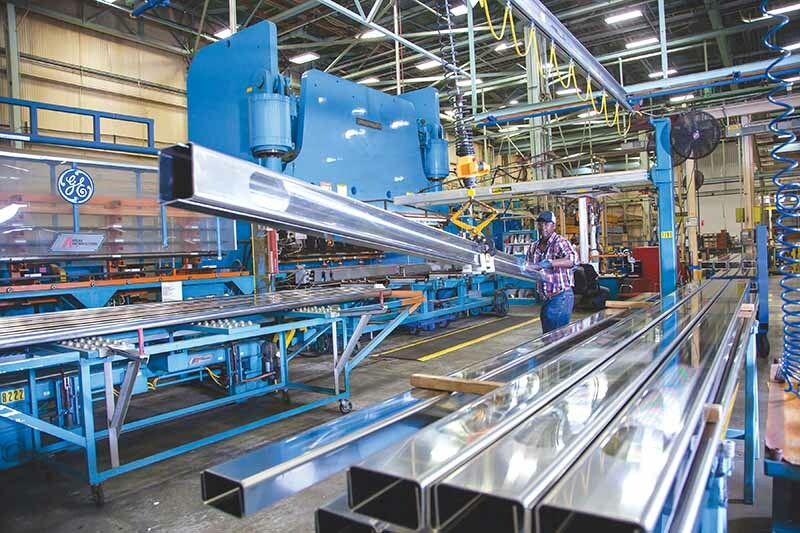 The price of stainless steel has gone up “pretty significantly” this year, said Mark Mehling, production control manager for Manufacturing Methods. The company was paying about 50 cents a pound more in July for stainless steel than it was at the beginning of the year, he said. 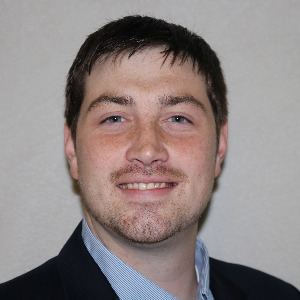 Shopping around for pricing, however, is already difficult, as material suppliers who used to give a price quote good for 30 days are now giving quotes that are subject to change because prices are fluctuating daily, Peterson said. “We haven’t seen that cause an issue in customers not placing orders. We just increase our raw material costs accordingly, which affects cost as a whole. In the end … it’s just increasing prices across the board on everything,” Peterson said. Price increases in stainless steel would affect the company’s medical side of the business, Mehling said. But on the aluminum side, concerns for the company lie in both the price increases and a potential shortage of supply for sheet metal products. “In aluminum 5052/3003, there could end up being a shortage unless some of these material companies decide that they’re just going to bite the bullet and pay the tariff, [and] import some of that material,” Mehling said. “The only fear of what’s going to happen is when we get a call in October for an order that requires 40 sheets of 5052 [aluminum] in eighth inch and they say, ‘Well, I’ve only got 10, and that’s all I can get until next March.’ That would be pretty scary. We would just have to turn that job away,” Peterson added. But both Peterson and Mehling agreed that a potential effect of the tariffs, at least for steel and aluminum, would be that U.S. mills could reap the benefits in reopening shuttered plants or expanding business.